Stacie Mayette Barnes has worked behind the scenes and as general manager of Home Made Theater for nearly two decades. 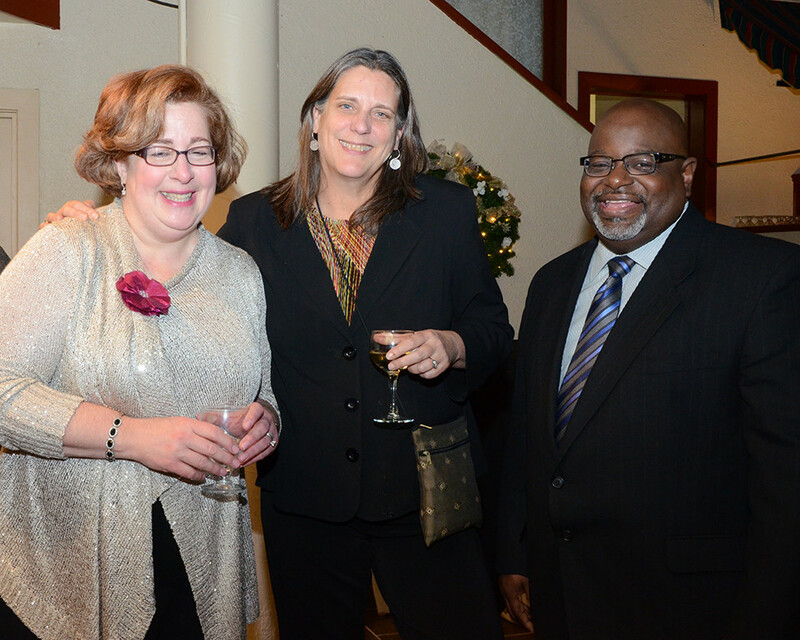 At “Saratoga Arts’ Soiree: A Night Celebrating the Arts” on Dec. 3 at Longfellows, she was the star of the show. Kate Morris, volunteer coordinator, called Stacie “the ghost light in a theater that is never left dark.” Barnes was thankful, funny, then teary eyed as she accepted the award. “Our community is rich with arts organizations,” she said. “It takes the work of so many people to create the magic of live theater… nearly 200 volunteers each year.” Starting in January 1985, just out of college, she went from sweeping the stage to finding props to being stage manager under general manager Susan Miller and director Jonathan Foster. When Miller left in 1995, Barnes took her place. Howard Barnes, Stacie’s husband, looked proud, as did her mom, Carmella Mayette, sisters and extended family. Sister Suzanne Mangini was joined by husband David, son Andrew and his wife Melissa, daughter Audrey and Aaron Moore. Skidmore president Philip Glotzbach and his wife Marie, a major force behind Saratoga Reads and Saratoga ArtsFest, attended, as did Skidmore theater director Carolyn Anderson and Anne Palamountain, Skidmore’s former first lady. Marie Glotzbach was the recipient of the inaugural Community Arts Achievement Award. Dee Sarno, longtime director of the Saratoga Arts Council, as it was then called, and Anne Carlisto attended, as did James Kettlewell, art historian and retired Skidmore professor. Kim and Greg Grieco, a board member of Saratoga Arts, chatted with Linda Dziengieleweski, a board member of HMT, and Mary Lou and David Snyder, former HMT board member. Eleanor Mullaney, a SPAC board member, husband Rob Coughlin, and Shane Williams-Ness of SPAC attended, as did Richard Wissler, James Lee, Lin Whittle, and Mary Huber. Elizabeth Woodbury Kasius & Heard performed by the indoor pond at Longfellows, where guests perused the koi fish as they waited at the bar under festive holiday lights.